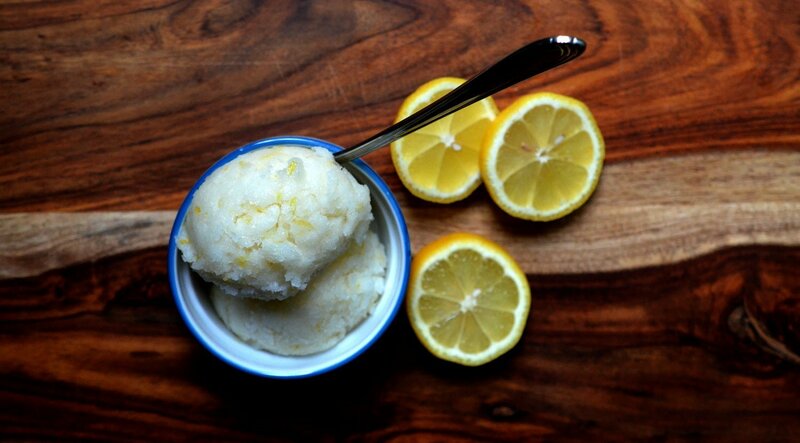 Lemon sorbet is one of my favourite desserts, especially when slightly tart. This variation is dairy-free, gluten-free and still dangerously delicious. Seriously, you have now been warned you may end up eating the whole bowl to yourself. The intense lemon flavour is thanks to non-traditional ingredients such as coconut milk and lemongrass, along with some lemon zest to give it extra punch. This takes very minimal effort and only about 10 mins to make. *If you’re not a fan of coconut flavour, try substituting coconut water for the coconut milk. It will bring out the lemon and minimize the coconut flavours. **Lemongrass can be easily grated and stored in the freezer. This technique also produces much better flavour than store-bought, freeze-dried lemongrass. See our tip on how to do this here. In a saucepan over medium heat, bring the water, sugar and lemongrass to create simple syrup. Once sugar is melted, remove from heat and let sit for 5 minutes. Using a fine mesh strainer, strain the lemongrass simple syrup into a medium bowl. Add the remaining ingredients and stir to combine. Pour the liquid into a large shallow freezer-proof dish. This will allow for even freezing and softening. Place in the freezer and stir every couple of hours to prevent large ice crystals from forming. Freeze for 24 hours. When ready to serve, heat a metal ice cream scoop under hot water. If sorbet is too hard to scoop, place in the fridge for about 1/2 hour to help soften before scooping. If your freezer is really cold, you might need to utilized a spoon to scrape the sorbet loose. If using a ice cream maker, follow manufacturers instructions.